Planning a perennial garden layout must take several factors into consideration. First and foremost are the types of plants that will thrive in the light, soil, and gardening zone where the garden is to be located. Second is choosing plants that offer a nonstop show of color from spring through fall. Choosing perennial plant kits from reputable nurseries takes the guesswork out of perennial garden layouts, or you can find plans online or in books and adapt them to your needs. Perennials plants return year after year from their original rootstock. Many familiar perennials are also old-fashioned favorites such as peonies, iris, purple coneflower, sedum and more. It's important to select plants that will thrive in the spot you've chosen for your perennial garden. Once planted, they will grow larger and sometimes spread out over the years, forming an attractive garden. Light - How much sunlight does the area receive each day? Soil - What kind of garden soil do you have? Climate - What gardening zone do you live in? Once you know these three things, you can begin choosing plants and designing your layout. Consider the height of the plants for your garden layout. Choose and plant taller perennials near the back of the garden bed so they do not obscure small perennials. Look on the plant label or in the plant catalog for the approximately height of the plant. 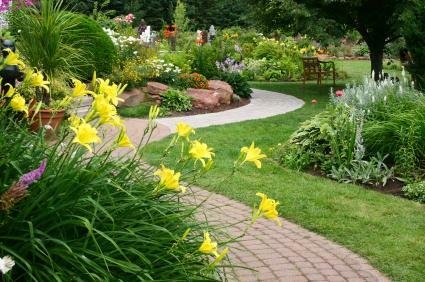 Some people like to plant monochromatic gardens, choosing colors in the same tone or family to create a soft, pleasing effect. White gardens are one such popular perennial garden; only white flowers are chosen, and foliage plants with soft gray-silver colors are added as accents. You can mix up your garden colors and plant whatever you like or choose single tones of red, blue or yellow. Unlike annuals, which bloom almost continuously from the time they are planted until the first frost, perennials typically have a blooming period of a few weeks during the spring, summer or fall. Be sure to choose perennials with different blooming times so that there is always some interesting color appearing in the garden. Annuals may be interspersed among the perennials for strong, bold, continuous color statements. Another tip when creating a perennial garden is to plant flowers in clusters of odd-numbered groups. Instead of planting two, plant three; instead of planting four, plant either three or five. Space them out according to the label or catalog directions to ensure planet of room for growth. Planting in odd numbers looks more natural from a distance than lining up flowers in long rows of even numbers. One time saver for anyone looking for a perennial garden layout is to buy a perennial garden kit. Kits are available from major nursery catalogs, such as Spring Hill, for sunny locations, shady locations, butterfly gardens and more. Each kit contains a planting graph that shows you where to plant each specimen in the garden bed as well as all the plants you will need for your garden. They're great for beginning gardeners who are unsure of what to plant or for filling in tricky areas like shady spots in the garden. They are also economical; garden packages and kits typically offer plants at a lower cost than buying them separately. Of course, you can find perennial garden plans online and in books. Many offer pictures to show you what the finished garden might look like. Keep in mind the original climate where the garden was planted. You might need to adapt the plan to suit your gardening zone. A perennial rock garden created for an Arizona home may look beautiful, but it might not thrive in your colder New England climate. Consider the plan and adapt it by choosing plants more suited to your gardening zone and soil. Better Homes and Gardens, which offers numerous perennial layouts and more. Doug Green's Garden - Doug Green brings you many perennial garden designs to choose from on his website.